A Game Boy Advance remake of Super Mario Bros. 3. Bowser and his Koopalings have transformed all the kings of the Mushroom World into animals. Mario and Luigi must travel through each world and defeat the Koopalings in order to change them back. 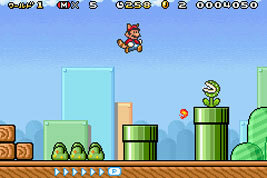 While the basic game is identical to the Super Mario All-Stars version of Super Mario Bros. 3, the game includes Card-e Reader support, allowing you to unlock new levels, special items and more by scanning cards. This function was not available in Europe.